Well for starters, we were awkward kids who were just transitioning into our teenage years when we first met through various YFC events. A very, very long story short: we dated for three years, broke up, “talked” on and off for three years, completely stopped talking, then finally, reconnected through a crazy and beautiful way only God could have planned. Fatima: I was apparently the dork and he was apparently so cool (though I beg to differ). I had a crush on him first when we first met at a YFC Camp in October 2002. We had a few encounters again after that camp, but nothing really started up until January 2004. Somehow I mustered up enough courage to ask Jon to the YFC Reunion Prom in January 2004 (which til’ this day shocks me). Thankfully, he said “yes” and that’s what started this whole journey. Despite the 200+ mile distance, we began dating at fifteen years old. Our relationship in its early days consisted of late night phone calls (remember when unlimited minutes began after 9pm? ), thousands of texts (I went over the text limit multiple times before “unlimited” was an option… Sorry, Mom! ), handwritten letters, and seeing each other once every four months, on average. It was tough and very uncommon to have a long distance relationship at that age, but somehow we got it to work for some time. It was great for awhile, until Christ wasn’t always put in the center of our relationship as He had been in the past. The distance grew tougher, conversations and prayers weren’t consistent. Our relationship’s foundation by then was on sand, and not on rock. We eventually grew distant and the relationship became very hard. In 2007, I broke things off. I had my struggles to deal with and knew God was calling me to be detached. As a young teenager, it was hard because 1) I didn’t want to be alone, and 2) this was God’s plan and not my own. That, at the time, was God’s biggest challenge for me. There were many times when I would second guess my decision and would try to pursue again. Although those pursuits were sought in my own fulfillment, I knew in my heart that I needed to be single and grow as a strong woman of God before I learned to truly love someone again. Jonathan: This was one of best times and also one of the toughest periods of my life. Best because this was a time where I truly found myself and toughest because it was when I grew up the most, the hard way. I still remember spending nights thinking how much more tough my life was. The emptiness was still there. And it wasn’t until I truly found myself in the muddy, slimey trough with the pigs when I realized that maybe, just maybe, it was better for me to be a servant in my Father’s House. In time, I began to grow in my relationship with God and finally trusted in His plan and not my own as I had in the past. I ran back home where I found God, my Father, running towards me instead with His arms outstretched. Since then, His plan has always been the best. It was because of this experience when God allowed me to know that I am still worthy to be a part of His plan for me. God is good. Fatima: A pivotal moment in our lives happened when I made a pilgrimage to the Holy Land in May 2010. I was carrying many crosses at the moment, but the heaviest were the on and off feelings I continued to hold on to for Jon. Those last few years I still worried about him as he explored other paths, and I would even cross the line and tell him things at random times such as “you’re better than that!” or “give your heart to God and just trust Him” because I couldn’t find a better way to show just how deep my care was for him. By the end of that trip and after much prayer and conversation, I knew it wasn’t no longer my place. On one of the last days spent in Jerusalem, I purchased two small wooden crucifixes. I decided to purchase one for myself and one for Jon. When I returned home I put together a package making his crucifix a parting gift along with a card saying I wouldn’t worry about him anymore, completely trusting in God’s plan for Jon. Praise be to God because He gave me the strength to do that courageously following that pilgrimage and I didn’t look back. Needless to say, those decisions changed everything. Jonathan: I still remember receiving that crucifix in the mail. The end of the card said “remember that the Eucharist keeps us united, so if we somehow were never to speak again, I am still united to you because of our shared faith, prayers, and the Eucharist… May God bless you always. AaF, Faye.” I remember not understanding it at first. Now, in hindsight, it’s crazy to think that that exact crucifix, our shared faith is what kept us bonded in those trying times. Even though we stopped talking completely after that trip, and for awhile, too, it was truly Christ’s great and sacrificial love that kept us united. The following year, she visited Virginia Beach for her post-graduation celebration with her family and the CFC-Youth Conference that happened at Old Dominion University (my alma mater!). I saw her again during those two occasions. Then, in July on one night, she randomly called and told me she was moving to the Hampton Roads area next month to do a Year of Volunteer Service with Catholic Campus Ministry (CCM) at ODU. I remember thinking to myself how absolutely crazy that was and how taken aback I was at the news. 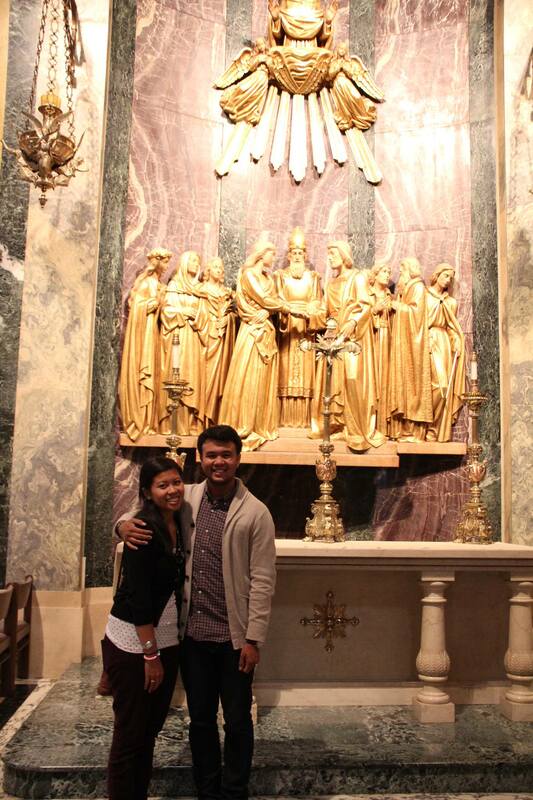 A few days after she moved into her apartment, we met up because she invited me to go to Adoration with her. While I was in Adoration, I heard God’s voice calling to me so clearly. That moment, right there, was start of my reversion back to the faith. Afterwards at Sonic, Fatima then straight up told me she didn’t move down for me. She also encouraged me to check out CCM…and so of course I did. Fatima truly was sent by God to help me become a better man and better son, because it was through CCM where I found my faith again. I was single-minded for Him and continued to trust in His plans. God’s beautiful plan for us during her year of service was to build a genuine friendship rooted in Christ, which was something we have never experienced. After her year of service was over, we had a serious talk about our friendship and the direction we believed it to be going. It was revealed that there was still a mutual interest, and in time, God put it in our hearts to be open once again. We decided to continue to pray for His will to be done and eventually on the Feast of the Holy Rosary, we both stated our intentions and the complete openness to a dating relationship. Spoiler alert: we were. 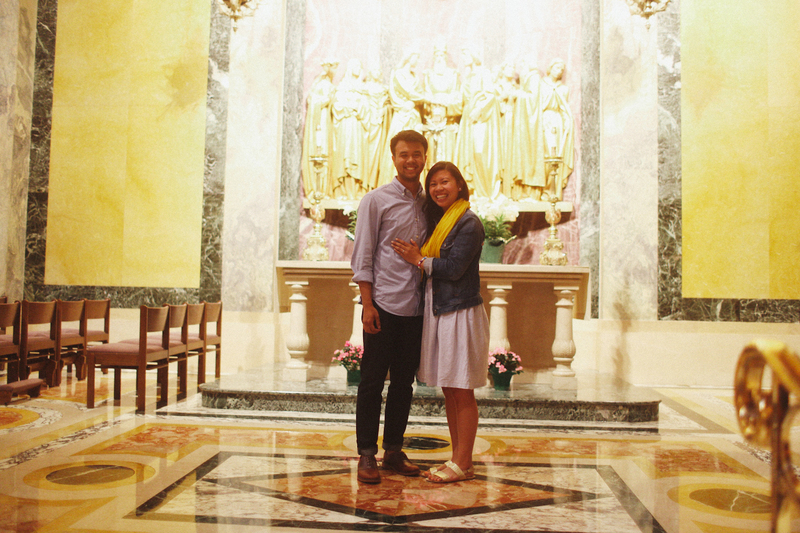 I asked her to be my girlfriend on October 8th, 2012 at St. Matthew’s Cathedral in D.C., in the Wedding Chapel of Mary and Joseph. This entire site is amazing! I haven’t read through everything, but I will in due time. I have just accepted my new role as a bridesmaid at my girlfriend’s wedding and am really getting into all the planning. 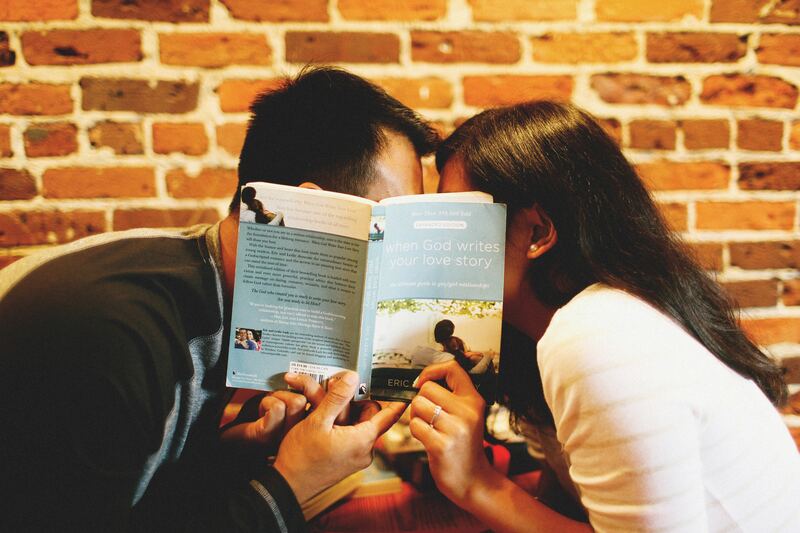 You guys have definitely showed me that Christ is so important in a relationship. I am so happy for the both of you.